Here are a few products that I’m downright envious of current or future Accutane patients having at their disposal. WHERE WERE THEY SIX YEARS AGO?? When you’re on Accutane, your whole life is moisturizers. Your skin will be drier than you could ever imagine, but on the plus side, you can go forever without washing your hair. My Accutane nurse told me to get an Aveeno moisturizer, which was good, but now I know about these three that are stellar. I only discovered Eucerin Healing Cream last week, and I wrote about it here. This stuff, quite literally, has the consistency of diaper rash cream. It is such a heavy formula that you’d be sure it would cause breakouts (I’d imagine putting diaper rash cream on your face would cause a breakout), but Eucerin would never do you dirty like that. The other thing I wish I had during my Accutane treatment? Dr Jart’s Cicapair Tiger Grass line. This green cream neutralizes redness, which you have a lot of during Accutane treatment, plus it has healing properties. It’s great to have a dual treatment that hides your current struggles while preventing them from getting worse. I only started using this a few months ago (and wrote about it here) and my FIRST thought was how useful it would have been during my Accutane treatment. And finally, the French miracle that is worth all the hype: Homeoplasmine. This souped-up Vaseline is my favorite thing to use on skin that’s healing post-breakout. It’s also a fantastic lip balm. Speaking of! Boiron now makes a Homeoplasmine specifically for lips. I’m telling you, the beauty innovations just keep getting better. I depended heavily on makeup during Accutane. My skin was actually the worst it has ever been during my course of treatment, and only improved after I was done. I was far too self-conscious to leave the house without makeup. 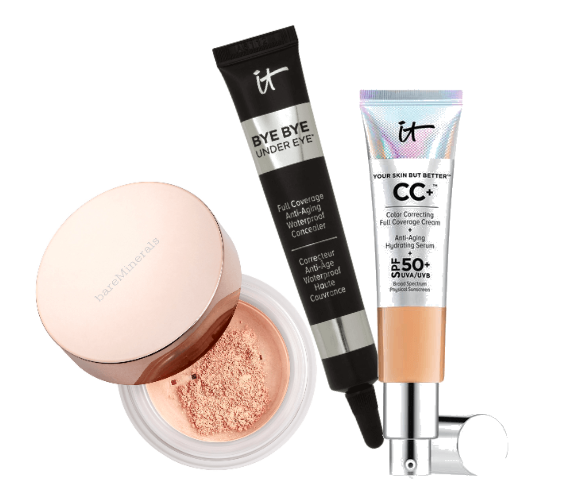 It Cosmetics was not nearly as big as it is now, and I would have loved to have known about Bye Bye Under Eye concealer. It’s super heavy duty an d waterproof, so if there’s something you want to cover, this is your pal (I talk all about it here). It’s not like you can only use this on your under eyes either - I tend to get really red around my nose, and this concealer is my go-to. It’s also great for post-zit hyperpigmentation. It Cosmetics also makes one of my all-time favorite base products: Your Skin But Better CC Cream. Not only will this cover up anything you may be feeling self-conscious about, but it’s got all kinds of skincare included. Hyaluronic acid, collagen, all kinds of vitamins, and sunscreen. I love this stuff so much that even though I’ve already written about it, I keep wanting to recommend it again and again. When I was on Accutane, I used Bare Minerals Loose Powder Foundation. You can build it up if you want more coverage, and mineral makeup doesn’t expire, so if you only wear makeup occasionally, this could be a great choice for you. I still use Bare Minerals if I want to cover a particularly rough spot, almost like a super-powered setting powder. Okay, the biggest difference between going on Accutane now versus years ago when I did, is that now Korean beauty is everywhere. And they make the best stuff! It’s been said that skincare in Korea is easily 10 years ahead of the US. My favorite kbeauty products are pimple patches and all things snail mucin. I would have committed twenty crimes to have had pimple patches at my disposal during my teen years. WHERE WERE THEY? As it is, I use these any time I have a zit (they’re especially good after you’ve picked at one) and I can’t stop raving about them. There are even patches for cystic acne that have tiny little needles in them. I haven’t tried them, but if I was prone to cystic acne I would make sure i always had them at hand. As for snail mucin, I’ve written about so many different snail products over the past year or so. Snail mucin is great for healing irritation, which you have plenty of during Accutane treatment. I use this snail essence every night under whatever moisturizer I’m using before bed (review here). Benton Snail Bee Steam Cream is great for putting over that essence and I LOVE the way it smells (review). Want your snails in a serum? Benton also makes one of those (I really have tried all of them, here’s another review), and I’ve also written about how I LOVE using the snail bee sheet masks before bed.